Visitors to the eastern side of Te Apiti – Manawatū Gorge will be greeted by Te Hononga Maunga, a carved entrance at the Ballance Bridge carpark designed to provide blessing and safe passage to all who pass by. Rangitāne o Tamaki nui-ā-Rua kaumātua Manahi Paewai will bless the carvings in a dawn ceremony on Monday morning, prior to the Minister of Conservation Eugenie Sage joining Te Apiti – Manawatū Gorge Governance Group members for a ribbon cutting event at 10am. Te Apiti – Manawatū Gorge Governance Group and Horizons Regional Council chair Bruce Gordon says that in addition to the carving ceremony, the Minister has been invited to see some of the work being done to enhance the biodiversity, recreational, educational and cultural values of the Gorge. “The Gorge Governance Group was established in 2016, formalising a collaboration of various organisations that had been underway for over a decade. This project work has helped contribute to the overall experience for approximately 70,000 visitors per year,” says Mr Gordon. “The Group is working to secure finances to deliver work programmes that contribute to a long-term vision. “Funding for work programmes primarily comes from contributions from the Department of Conservation, Horizons Regional Council, Palmerston North City Council, Manawatu District Council, Tararua District Council, KiwiRail and the NZ Transport Agency. “Through the partnership of councils, iwi, DOC and landowners the Group has completed biodiversity management and health and safety plans, as well as successfully securing $105,800 of central government funding towards installing larger toilet blocks at both ends of the popular visitor destination and $100,000 towards targeting invasive weeds within the Gorge. “On the ground work for pest plant and animal control is continuing to contribute to improved biodiversity, and we are investigating the possibility of reintroducing native species previously found in the area. “Recent developments to increase recreational user experience include a walking bridge upgrade at the eastern end of the 11km Manawatū Gorge track, plant identification signage along the entire length to help educate visitors about the special flora, including the rare maidenhair fern, that live in Te Apiti, and the Te Ara o Mahurangi Mountain Bike Trail. “The popular Tawa Loop track at the western end of the Gorge is scheduled to receive an extensive upgrade in Autumn 2019. “Wider work is also underway to plan for future enhancement, including proposed new visitor facilities and recreational trails to complement the Te Ahu a Turagana: Manawatū Tararua Highway construction on the northern side of the Gorge. Rangitāne o Tamaki nui-ā-Rua kaumātua Manahi Paewai says the name Te Hononga Maunga refers to the unique position of the Gorge between two mountain ranges and was a revered place to Rangitāne. “Rangitāne people, who reside both east and west of Te Apiti would recite karakia (prayers) when travelling through to invoke safe passage,” says Mr Paewai. Signage at the site provides an explanation of the carvings’ history. Further signage highlighting particular aspects of the carvings, including guardians, ancestors and unique patterns to Rangitāne, will be added in early 2019. Following the ribbon cutting event Minister Sage will head to Te Waha o te Kurī, Ferry Reserve to hear from members of the Manawatū River Leaders’ Accord about work underway to protect and enhance the Manawatū River and catchment, of which the Gorge is a special feature. UPDATE: The application of pre-feed baits planned for 14 November 2018* was postponed due to wind. Notification will be given before the next attempt is made. *Original update: Recreational tracks in Te Apiti - Manawatū Gorge will be closed on Wednesday 14 November during aerial application of non-toxic baits for pre-feeding. Signage will be in place and DOC rangers will be stationed at track entrances to inform visitors during the operation. Tracks will be closed for a second time during application of toxic baits at least five days later, at the next suitable weather window. Cereal baits containing the pesticide 1080 will be applied over approximately 900 ha of Te Apiti - Manawatū Gorge to enhance forest health and protect native wildlife. Tracks will be open as normal outside of these times. The Department of Conservation will be conducting a pest control operation over approximately 900ha of Te Apiti - Manawatū Gorge this spring, to enhance forest health and protect native wildlife. The operation will take place between 23 October and 7 December 2018, as weather allows. Recreational tracks within the Gorge will be closed to the public for a short time during aerial application of baits on two occasions – once for the pre-feed and again at least five days later for the toxic baits. DOC rangers will be stationed at track access points to inform the public while the operation is taking place. Tracks will be open and safe for use outside of these times. Bait application requires specific weather windows, so exact dates are not known at this time but updates will be posted on our website, and to Facebook and Instagram. The forest and wildlife of Te Apiti – Manawatū Gorge is battling for survival. Every day rats and possums kill birds and other native animals, and browse on forest plants preventing regeneration. Rat and possum numbers in the Manawatū Gorge forests are currently much higher than is accepted for forest health and successful breeding of forest birds. Due to terrain and access, ground-based control methods cannot safely and effectively treat the entire site. The road closure presents a unique opportunity to treat both sides of reserve at once. Please click here for a factsheet that provides general information about the Battle for our Birds operation. Single pan permaloos at both ends of Te Apiti – Manawatu Gorge have been replaced with larger toilet blocks to support increasing visitor numbers to the popular scenic reserve. The new facilities were funded through a successful central government mid-sized tourism fund application of $105,800 received earlier this year, as well as additional funding of $20,000 each from Horizons Regional Council, Palmerston North City Council, and Tararua District Council respectively. Te Apiti – Manawatu Gorge Governance Group and Horizons Regional Council Chair Bruce Gordon says that while the road may be closed the reserve’s recreational facilities are still very much open. “Te Apiti – Manawatu Gorge is a highly prized destination that offers a range of recreational opportunities in a highly-visited, biodiversity managed and scenic location. “Last year’s figures showed that the area had over 100,000 visitors, with walking track numbers increasing by 350 per cent since 2012, and an estimated 100 campers staying in Ferry Reserve every week over summer. “This meant the toilet facilities at the respective Ashhurst car park and Ferry Reserve ends of the Manawatu Gorge had outgrown their capacity. “Four bush walks, including the newly re-routed 11 km full length walking track, a mountain bike trail, and freedom camping, fishing, swimming and a designated BBQ area at Ferry Reserve means the Manawatu Gorge is one of the Region’s best places for recreation. The Te Apiti – Manawatu Gorge Governance Group is a collaboration between Horizons Regional Council, Manawatu District Council, Palmerston North City Council, Tararua District Council, the Department of Conservation, iwi, landowners and individuals. Formed in 2016, in its first year the Group’s actions included a budget for pest control and parks and reserve management, and the compiling of an overarching biodiversity management plan for the area. They also funded work to upgrade the Grade 3 Te Ara o Mahurangi mountain bike track. A proposed new 4km walking track at the Ashhurst end of the Gorge and new mountain bike track are being considered as a result of the Accelerate25 Manawatū-Whanganui Economic Action Plan. Mr Gordon says the Governance Group’s membership reflects the high level of commitment towards protecting, enhancing and sustaining the wider Manawatu Gorge area. “Not only is it about collectively funding initiatives, it is about on the ground work,” says Mr Gordon. The toilet facilities in the Ashhurst end carpark will be maintained by Palmerston North City Council, and the ones at the Ferry Reserve will be maintained by Tararua District Council. “Tourism is hugely important to many of our regional economies and infrastructure is essential to harnessing the benefits of growth in the sector,” says Mr Gordon. Horizons Regional Council is working with river users to restrict on-water activities through Te Apiti - Manawatu Gorge as a safety precaution. The Gorge has been closed to traffic since two large land slips blocked the road in April. New Zealand Transport Agency (NZTA) geotechnical reports have identified that rock conditions remain unstable and further slips are possible. Horizons emergency manager Ian Lowe says due to the high risk of rock fall into the Manawatū River the Council has restricted on-water activities on the stretch of the river through the Gorge until further notice. “Under our navigation safety function we are advising all river users to keep clear of the stretch between the road bridge downstream of Ferry Reserve and the confluence of the Manawatū and Pohangina rivers. Signage advising this will be erected at Ferry Reserve, the Ashhurst end carpark to the walking tracks and Ashhurst Domain. Horizons chairman Bruce Gordon says the Te Apiti – Manawatu Gorge walking tracks remain open and encourages the public to continue using them. “While the river and road are closed, the tracks are still open for business. Based on information from NZTA’s geotechnical reports, we have determined the tracks are at least 300 metres away from the furthest possible slip area in established native forest, and at very low risk of being affected. Mr Lowe says Horizons is working closely with a number of agencies such as NZTA, the Department of Conservation, local Councils and Police to plan for a number of possible scenarios. Members of the public are reminded to please stay away from the slip site and not proceed beyond the locked gate at the entrances to the Gorge. For more information on the Gorge road closure go to this NZTA web page and for track information please see the alerts page on our website. The Department of Conservation (DOC) will be contributing an extra $100,000 to target invasive weeds within Te Apiti - Manawatu Gorge. The funding is part of DOC’s ‘Dirty Dozen’ weeds programme benefitting weed control projects across the country, targeting those weeds identified as doing the most damage to our natural landscapes. The Te Apiti - Manawatu Gorge Governance Group, made up of senior representatives from Horizons Regional Council, DOC, Palmerston North City Council, Tararua District Council, Manawatu District Council, iwi and a community representative, welcome this much needed funding boost. The Group’s membership reflects the high level of commitment towards protecting, enhancing and sustaining the biodiversity, recreational, educational and cultural values of the wider Manawatu Gorge area. The Gorge offers a range of recreational activities in a highly-visited biodiversity management and scenic location, which has the potential to contribute to a stronger economy, community and cultural wellbeing. The Governance Group has set itself goals, which in its first year includes budget for pest control and parks and reserve management, and the compiling of an overarching biodiversity management plan for the area. DOC director operations Lower North Island and Te Apiti – Manawatu Gorge Governance Group member Reg Kemper says the funding will target two areas. $80,000 will be used for ground control of old man’s beard and the remaining $20,000 will be used for control of Japanese honeysuckle and wandering willie. “This funding is in addition to the project’s current $50,000 budget, which we hope will allow us to treat all accessible old man’s beard vines in the project area during the upcoming season,” says Horizons Regional Council and Te Apiti – Manawatu Gorge Governance Group Chair Bruce Gordon. “If this is achieved, future old man’s beard control will consist of maintenance works at a much reduced cost and the native forest will be protected from one of its major threats,” says Mr Gordon. The work to control Japanese honeysuckle and wandering willie will be undertaken by Rangitane iwi, who are stakeholders in the Te Apiti - Manawatu Gorge project. “This extra funding is most welcome as we hope the control work carried out on these two weeds will make a significant impact on the project area,” says Mr Gordon. “It comes at a time when the Gorge is faced with significant challenges due to its roading infrastructure. However, we want to remind everyone that the walking and mountain bike tracks are still very much open. “The recreational values of the Gorge have continued to prove popular over the last five years, with walking track visitor numbers increasing by 350 per cent since 2012. The Governance Group has funded work to upgrade the Grade 3 Te Ara o Mahurangi mountain bike track, re-routed the 11 km full length walking track, made commitments towards the development of a new 4km walking track at the Ashhurst end of the Gorge and a toilet on the Tawa Loop track, as well as received central government funding to replace single pan permaloos with larger toilet blocks at both ends of the popular visitor destination before the start of summer. Mr Kemper says DOC staff are currently working to assess and long-term implications of track stability and safety. Maintenance includes monthly inspections in accordance with DOC standards for this kind of facility. “We also complete other inspections in response to natural events such as storms and earthquakes, as well as in response to user feedback about track conditions or issues,” says Mr Kemper. The Gorge Governance Group will be presented with a geotechnical report on land stability in the park’s recreational areas at its August meeting. Tourism Minister Hon Paula Bennett announced today that Te Apiti – Manawatu Gorge will receive $105,800 to help replace single pan permaloos with larger toilet blocks at both ends of the popular visitor destination. As part of a wider $5.2 million national announcement, Minister Bennett said this funding will be a relief for communities responding to the steady stream of visitors they are seeing. “Tourism is hugely important to many of our regional economies and infrastructure is essential to harnessing the benefits of growth in the sector,” she says. Te Apiti – Manawatu Gorge Governance Group and Horizons Regional Council Chair Bruce Gordon says walking track visitor numbers have increased by 350 per cent since 2012. “This has meant the current toilet facilities at the respective Ashhurst Carpark and Ferry Reserve ends of the Manawatu Gorge have outgrown capacity,” says Mr Gordon. “A proposed new mountain bike track is being considered as a result of the Accelerate25 Manawatū-Whanganui Economic Action Plan; such a development will further increase visitor pressure given this activity is a year round one that isn’t weather dependent. The estimated cost of the project is $178,000. In addition to central government’s funding Horizons Regional Council, Palmerston North City Council, and Tararua District Council will contribute $20,000 each. Tararua Mayor Tracey Collis says as well as walking visitors, an excess of 8,000 vehicles a day on average travel through this part of the Region, and an estimated 100 campers stay in Ferry Reserve every week. “The recreational values of the Gorge continue to prove popular. Encouraging more visitors to stay in the area, and giving them a quality experience while they are here is good for our economy,” says Mrs Collis. 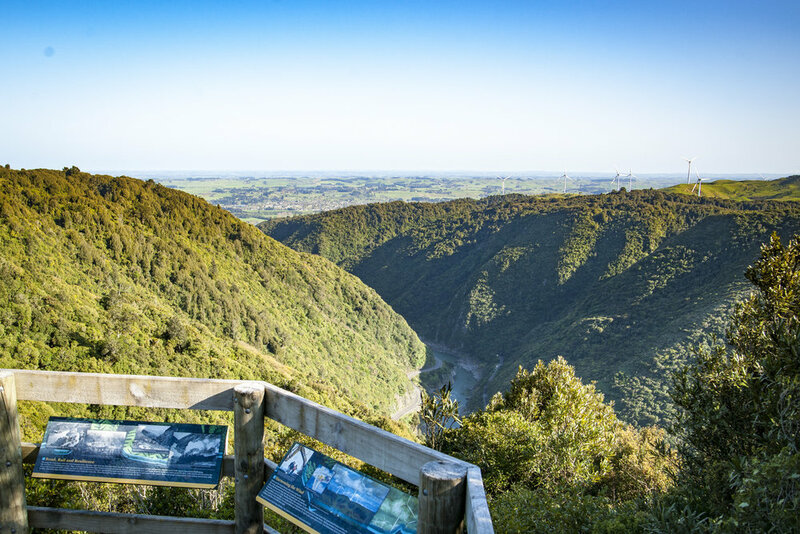 “Te Apiti – Manawatu Gorge is highly prized by locals for its recreational, biodiversity, cultural and educational value with more that 100,000 visitors in the last year,” says Palmerston North Mayor Grant Smith. The mayors and chair are part of the recently formed Te Apiti – Manawatu Gorge Governance Group, a collaboration between the three councils, along with Manawatu District Council, Department of Conservation, iwi, landowners and individuals. Mr Gordon says the Group’s membership reflects the high level of commitment towards protecting, enhancing and sustaining the wider Manawatu Gorge area. “The Governance Group has set itself a 10-year vision, which in its first year includes budget for pest control and parks and reserve management, and the compiling of an overarching biodiversity management plan for the area. We have also funded work to upgrade the Grade 3 Te Ara o Mahurangi mountain bike track. Last month, Conservation Minister Hon Maggie Barry opened the newly re-routed 11 km full length walking track and also made commitments towards the development of a new 4km walking track at the Ashhurst end of the Gorge and the toilet on the Tawa Loop track. Relocations within the park are also planned for the single pan permaloos. A section of the Manawatu Gorge Track traversing Te Apiti Manawatu Gorge has recently been re-routed around a large slip towards the eastern end. The re-route has added approximately 1 km to the length of the track, climbing up and around the active slip site. This should add about half an hour to your usual walking time. There may be some movement and slumping of earth on the new track as it settles. This is normal; we will be undertaking regular monitoring and remedial workover the next few months to manage this. The full 11 km Manawatu Gorge Track is currently open and safe to walk. Take care when walking the new section and report any significant damage to DOC’s Palmerston North office (email manawatu@doc.govt.nz or phone +64 6 350 9700).